For a good internet guide to Mull and the rest of Scotland try The Internet Guide to Scotland maintained by Joanne Mackenzie-Winters, we think it’s the best! The Isle of Mull is at the centre of a whole group of islands, the best known of the smaller islands being Iona, famous as the cradle of Scottish Christianity, and Staffa, known for Fingal’s cave. Other islands within the group are Ulva, Gometra and the Treshnish Isles. There are plenty of boat trips available to make for a memorable day out, but for landlubbers the views of the Islands from Mull itself can be spectaular. A Mull sunset is never to be forgotten. 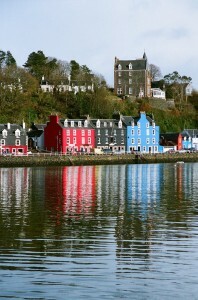 The Island capital, Tobermory, is a charming little town with a picture postcard harbour and interesting shops. Fishing sea and river fishing may be enjoyed within easy reach of the cottages. Salmon, sea trout, brown trout and rainbow trout are all plentiful. The estate has fishing on the Aros River and up to two rods are available to let by the day. Sailing, Diving and Hill Walking are also poular pursuits on the Island. white-tailed sea eagle has bred sucessfully. There are many Historic and Archaelogical sites to be explored on the island generally, but an ancient track starts at the hill gate beside Kate’s Cottage and leads past the fort and through the forest to the archaelogical site of Killiechronan on Loch na Keal. Aros Castle ruins are a short walk away from the estate and are reputed to have been visited by Robert the Bruce. 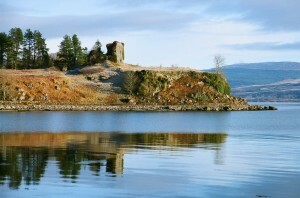 Other famous castles on Mull are Duart and Torosay. 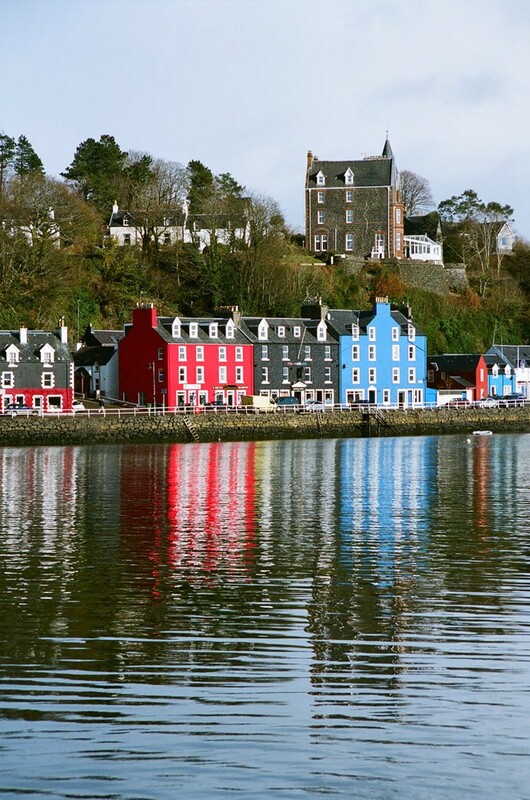 Golf is well catered for with two 9-Hole courses on the Island, the course at Tobermory offering superb views as well as fresh air!